In John’s vision, He saw Him holding a scroll sealed with seven seals in His right hand. No one dares to open the scroll. John cried very much because no one is righteous enough to open the scroll. John looked and he saw four creatures. Among the four creatures is a slain Lamb with seven horns and seven eyes. The seven eyes are the seven spirits that God had sent out into the world. The Lamb went to Him who is sitting on the throne and took the scroll from Him. Then John saw the Lamb open the first seal of the scroll. One of the four creatures said to John in a loud voice, “Come and see.” John looked and he saw a man holding a bow was sitting on a white horse. A crown was given to him and he went out conquering the world. The man who sat on the white horse represents the Antichrist who is winning over the nations at the beginning of the seven period of his reign. The Lamb opened the second seal of the scroll. John heard the second creature said to him, “Come and see.” John looked and he saw a fiery red horse went out to take away the peace of the earth, to make people kill each other. The man who sat on the fiery red horse was given a big sword. The red horse represent blood and the big sword represent big war which will be followed by the deaths of many people. The second seal is telling us that the autocratic government of the Antichrist will not be so smooth and without stumbling blocks. Many people will refused to do what the Antichrist commanded and it will lead to civil war. The Lamb opened the third seal. John heard the third creature said to him, “Come and see.” John looked and saw a man holding a pair of scales sitting on a black horse. Then the four creatures said,” A measure of wheat for a penny, and three measures of barley for a penny; and see thou hurt not the oil and the wine.” (King James Version. Revelation 6:5). The third seal represent great famine. The third seal is telling us that many people will reject the Lord Jesus Christ as Savior when the Antichrist persecute the Christians by forcing them to submit to him or he will kill them. But those who hold firm to their faith and not submit to the Antichrist will be saved. The Lamb opened the fourth seal. The fourth creature said to John, “Come and see.” John looked and he saw a pale horse. Then he saw the name of the rider of the pale horse is Hades. 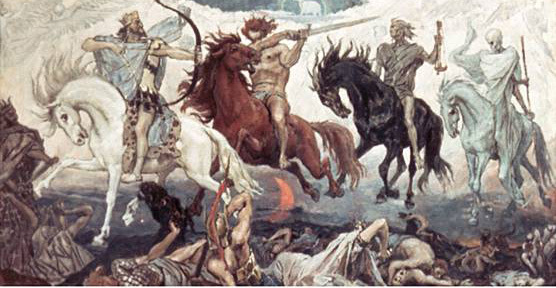 Power was granted to the rider of the pale horse to kill 1/4 of the earth. The fourth seal brings more plagues and warfare. When the Lamb opened the fifth seal, John saw many saints who were martyred for the sake of the gospel. Then the martyrs cried out to Him, “When will you take vengeance against those who kill us?” A white garment was given to the martyrs. He told them that the number of the martyrs must be completed vengeance will be taken against their enemies. The fifth seal is telling us about the cries of the martyrs at the end times and God will destroy their enemies at the appointed time. When the Lamb opened the sixth seal, John looked and saw a violent earthquake. The sun is no longer shining and has become black. The moon is red color like blood. There are no more stars in the sky. The sixth seal is telling us that during the end times, there will be massive earthquake that will cause severe destruction. There will also be other catastrophic natural disasters. The sun will be black and not giving out light anymore. The moon will become red color and no more stars will be seen on the sky. When the Lamb opened the seventh seal, everyone kept quiet. Seven angels stood before God and each angel was given a trumpet. A different angel holding a golden censer came and stood at the altar. He has a lot of incense and he offered the incense along with the prayers upon the golden altar before the throne. The angel filled the censer with fire from the altar and threw it toward the earth so that it causes thunders, lightning, and earthquake. The first angel blew the first trumpet and hailstorm rained down from heaven and many vegetation crops will be destroyed. One third of the trees of the earth and grass will be consumed by hailstorm. The second angel blew the second trumpet and the seas are struck with natural catastrophe and 1/3 of the people and animals in the sea will die. The third angel blew the third trumpet and this time it causes the water to be poisoned and many people who drink the water will die. The fourth angel blew the fourth trumpet and one third of the sun, moon and the stars will no longer give out light. One third of the day will have no sunshine like the night. The first four trumpets of the four angels serves as a warning to the people to repent from their sins that God is having mercy on them by bringing calamities to only one third of the population. The fifth angel blew the fifth trumpet. False prophets will rise up and deceive believers who have little faith. The fifth trumpet is God’s punishment on the unbelievers who are not under the cover protection of God. The devil will torture them but not kill them. The torment will be so severe that they will seek death but not find it. The sixth angel blew the sixth trumpet. God released his wrath and he kills one third of the non believers’ population. After this calamity, other non believers still does not realized God’s punishment and did not repent of their idolatry sins and other sins. John saw a strong angel holding a small book in his hand. When the strong angel opens the book, he shouted out like a lion. Then the seven thunders uttered. John was about to write down what the seven thunders said, but the strong angel told John not to record down it. John took the small book from the angel and swallowed it. It tasted very sweet like honey in John’s mouth but bitter in John’s stomach. The angel told John that he must prophesy again to the people. The two witnesses will have power to do miracles as often as they want. After they had finished testifying for God, Satan will overcome them and kill them. But God will raise the two witnesses after 3 and a half days then they will be risen up into heaven in their body. When the seventh angel blew the seventh trumpet, it was time for Jesus Second Coming. All the kingdoms on earth will belong to our Lord Jesus Christ and He will reign forever! Then John saw the seven angels holding seven bowls of God’s wrath. The seven bowls of God’s wrath are the seven last plagues on earth. The first angel poured out the first bowl of wrath and sores break out on the people who put their trust in the Beast and worship his image. The second angel poured out the second bowl of wrath and the water in the sea turns into blood. Every creatures that lives in the sea died. The third angel poured out the third bowl of wrath and the waters in the rivers and springs turn into blood. The fourth angel poured out the fourth bowl of wrath and the climate of the world change and becomes very hot. The fifth angel poured out the fifth bowl of wrath and there is no more sun but darkness and pain on earth. The sixth angel poured out the sixth bowl of wrath and the Euphrates River dried up. Then John saw three unclean spirits like frogs come out of the dragon and perform miracle signs to the kings of the world to assemble an army against God Almighty on the day of Armageddon. The seventh angel poured out the seventh bowl of wrath and a violent earthquake shook the earth. The great city on earth was divided into three parts and its nations fell apart. God also rain hail storms on mankind.